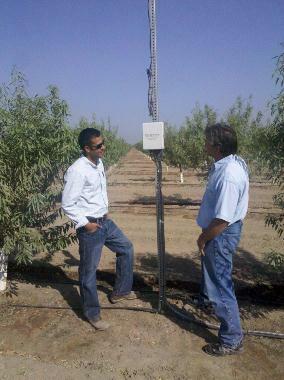 PureSense customer Jay Mahil and PureSense Support Manager Kevin McDougal discusses new almond orchard irrigation strategy. Farm Bureau Members since 2011. What year did your Company get started? What kinds of products do you sell? What brands? PureSense helps growers make better irrigation decisions through a custom combination of hardware, software, field service, and decision support. In short, we provide a full 360 degree solution that delivers value to the grower by improving crop yields, crop health and resource management which ultimately results in more profitable returns. We are also working with growers to install free pump monitoring equipment as incentives to save energy during peak demand events. Participation in the events is voluntary and at no time does the grower relinquish control of his pumps. There is no cost for the grower to participate. In fact, growers are likely to earn credits through the program that will significantly discount or even provide free soil moisture monitoring equipment as well. What changes have you made in your business to stay up to date with current trends? Are you concerned with the water issues that we face in the Central Valley? What are your specific concerns? Water is a precious limited resource and demand will continue to increase as environmental initiatives, the economy and the state’s population grow. Agriculture has done a good job of improving efficiency (through drip irrigation and other water saving measurers) in terms of crop produced per drop. As an industry we must do a much better job of telling our story. As a company, PureSense technology is exciting and timely because it provides growers a documented history of efficiency initiatives, an objective measure of achievement and an ongoing process of continuous improvement in irrigation, water monitoring and control. The Farm Bureau offers many great benefits, one of which is a venue for communication directly to our audience. Farmers read The Farm Bureau, period. Because of this we are an active advertiser in your publications.